CCleaner can be run in 47 languages: Albanian, Arabic, Armenian, Azeri (Latin), Belarusian, Bosnian, Brazilian Portuguese (Portugues do Brasil), Bulgarian, Catalan (Catala), Chinese (Simplified), Chinese (Traditional), Croatian (Hrvatski), Czech (Ceský), Danish, Dutch (Nederlands), English, Estonian (Eesti keel), Farsi, Finnish (Suomi), French (Français), Galician, Georgian, German (Deutsch), Greek, Hebrew, Hungarian (Magyar), Italian (Italiano), Japanese, Kazakh, Korean, Kurdish, Lithuanian (Lietuviu), Macedonian, Norwegian, Polish (Polski), Portuguese (Portugues), Romanian (Romana), Russian, Serbian (Cyrillic), Serbian (Latin), Slovak, Slovenian, Spanish (Espanol), Swedish (Svenska), Turkish (Türkçe), Ukrainian, Vietnamese. 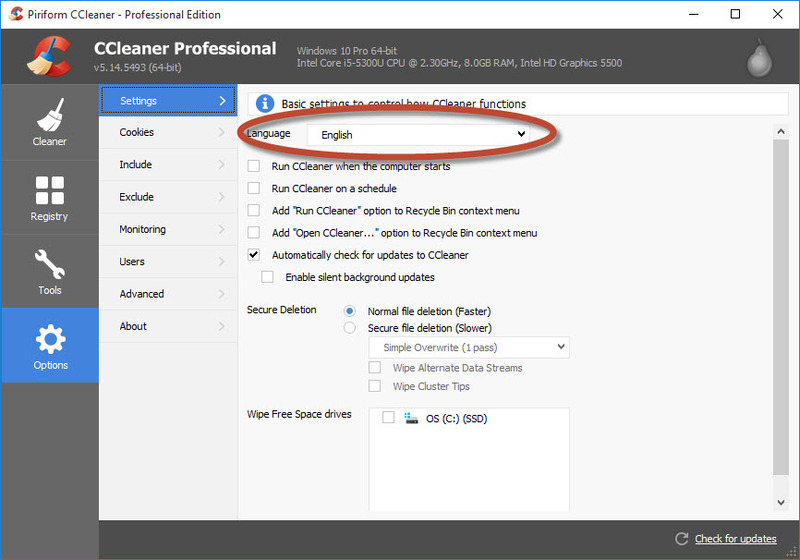 To change the language CCleaner is running in, start CCleaner and click on the Options button at left. In the Settings window, select the language from the Language drop-down box.